Dropbox’s second quarter results came in ahead of Wall Street’s expectations on both the earnings and revenue front. The company also announced that Dennis Woodside, who has been the chief operating officer for more than four years, will be leaving the company. Woodside joined at a time at Dropbox when it was starting to figure out its enterprise business, which it was able to grow and transform into a strong case for Wall Street that it could finally be a successful publicly-traded company. The IPO was indeed successful, with the company’s shares soaring more than 40% in its debut, so it makes sense that Woodside has essentially accomplished his job by getting it into a business ready for Wall Street. The stock exploded in extended trading by rising more than 7%, though even prior to the market close and the company reporting its earnings, the stock had risen as much as 10%. But following that spike, Dropbox shares are now down around 5%. Dropbox is one of a number of SaaS companies that have gone public in recent months, including DocuSign, that have seen considerable success. While Dropbox has managed to make its case with a strong enterprise business, the company was born with consumer roots and has tried to carry over that simplicity with the enterprise products it rolls out, like its collaboration tool Dropbox Paper. Q2 Revenue: Up 27% year-over-year to $339.2 million, compared to estimates of $331 million in revenue. Q2 GAAP Gross Margin: 73.6%, as compared to 65.4% in the same period last year. 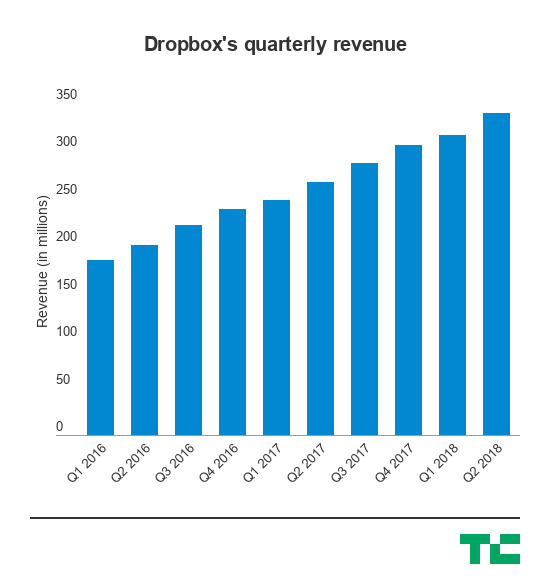 So, not only is Dropbox able to show that it can continue to grow that revenue, the actual value of its users is also going up. That’s important, because Dropbox has to show that it can continue to acquire higher-value customers — meaning it’s gradually moving up the Fortune 100 chain and getting larger and more established companies on board that can offer it bigger and bigger contracts. It also gives it the room to make larger strategic moves, like migrating onto its own architecture late last year, which in the long run could turn out to drastically improve the margins on its business. The company is still looking to make significant moves in the form of new hires, including recently announcing that it has a new VP of product and VP of product marketing, Adam Nash and Naman Khan. Dropbox’s new team under CEO Drew Houston are tasked with continuing the company’s path to cracking into larger enterprises, which can give it a much more predictable and robust business alongside the average consumers that pay to host their files online and access them from pretty much anywhere.